SOHO – 15 years today | Wott's Up With That? “SOHO – 15 years today“. Another bald press release copy-and-paste from Anthony Watts. NASA announced that December 2nd is 15th anniversary of the SOHO (Solar and Heliospheric Observatory) spacecraft. 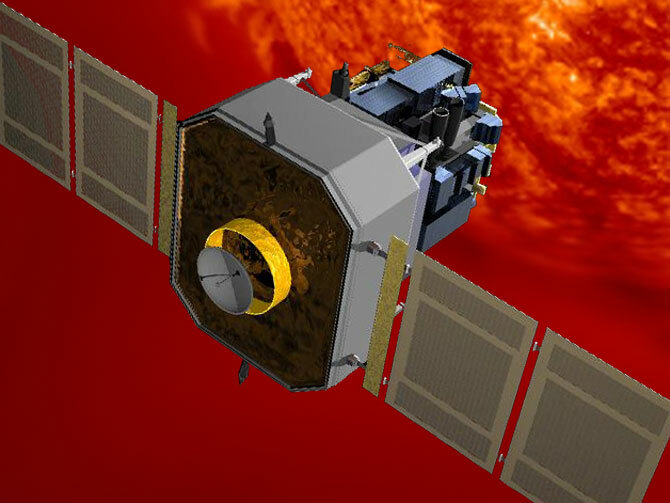 Artist's concept of the SOHO spacecraft. Learn more on NASA's website unless you're stupid enough to rely on Watts. Don’t you understand what this means? Before SOHO we knew absolutely nothing about the sun, therefore we can confidently say that the sun is the cause of the global warming, which isn’t happening. Thanks to SOHO, now we know the sun is on the verge of a new Maunder Minimum that will plunge us into the next ice age. It’s therefore imperative that we expand the development of unconventional petroleum reserves to ensure that those unfortunate souls in the developing world can have the necessities like electric blankets that have allowed civilization to exist in cold climates. At the same time it would have the added benefit of ensuring accelerated CO2 production to stave off the ice age, although the CO2 greenhouse effect has been debunked by many of the world’s leading physicists. SOHO is THE development that has allowed Western civilization to flourish! Happy Anniversary!